5 Former New Orleans Police Officers Plead Guilty Over Danziger Bridge Killings : The Two-Way Their previous sentences had carried a collective weight of more than 200 years in prison. The new plea deal reduces that to less than 45 years in total. In 2005, the Danziger Bridge was the scene of a police shooting that left two unarmed people dead and several others seriously wounded. Nearly five years after a federal jury found them guilty of either gunning down unarmed civilians or covering up the incident on New Orleans' Danziger Bridge, five former police officers have entered guilty pleas as part of a deal with the government. The deal sharply reduces the penalties they faced before their initial convictions were overturned in 2013 over prosecutorial misconduct. The judge in the case accepted the terms of the deal shortly before 1 p.m. local time, after a hearing on the case began around noon. In court today, former Officers Kenneth Bowen, Robert Faulcon, Robert Gisevius and Anthony Villavaso pleaded guilty to three counts each: deprivation of rights under color of law, conspiracy to obstruct justice, and obstruction of justice by engaging in misleading conduct. Arthur Kaufman, the former officers' supervisor who was accused of arranging a cover-up, pleaded guilty to two counts: conspiracy to obstruct justice and falsification of evidence to obstruct justice. Their punishments are markedly less severe than those the officers received four years ago: While their previous sentences had carried a collective weight of more than 200 years in prison, the plea deal reduces that to less than 45 years in total. "Four of the officers have been in prison since 2010," Eve Troeh of member station WWNO in New Orleans tells our Newscast unit, adding that Kaufman was not in prison because he "was not directly involved in the shooting." In addition to the prison sentences, each defendant was assessed a $100 fee for each count, by the judge's order. Civil lawsuits filed by the victims' families against the former officers are still ongoing, as the local news site NOLA.com reminds us. When they were initially found guilty, Bowen, Faulcon, Gisevius and Villavaso were all sentenced to more than 30 years in prison. Faulcon got the most time: 65 years for "killing [a] mentally ill man with a shotgun blast to the back," as the Two-Way reported back in 2012. His new prison sentence would be for 12 years. Both Bowen and Gisevius went from facing prison terms of 40 years each to 10 years; Villavaso, from 38 years to seven. Kaufman initially was ordered to spend six years in prison for covering up the others' actions; today, he agreed to a three-year sentence. All of the former officers' arrangements with prosecutors give them credit for time served and include up to five years of supervised release. The case of a sixth former officer is still pending, federal prosecutors say. In addition to the former officers who are involved in today's plea deal, several other officers pleaded guilty in 2011 to charges such as deprivation of civil rights, false prosecution and obstruction of justice. Two people died in the Sept. 4, 2005, shooting: James Brissette, 17, and Ronald Madison, 40. Four other people were left seriously wounded. 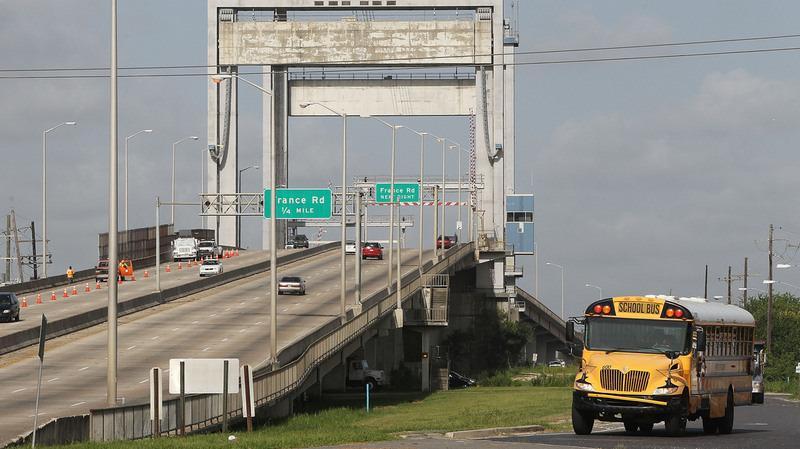 They had been part of a group of people trying to cross the Danziger Bridge to get help during the catastrophic days that followed the arrival of Hurricane Katrina. One of the people seriously wounded was Susan Bartholomew, who had been crossing the bridge with a group that included her two children and her husband Leonard, a longtime employee of the New Orleans Sewerage and Water Board. A year after the shooting, Bartholomew, who by then had moved to Texas, told NPR's John Burnett, "I never thought I'd be shot. And I never thought I'd be shot by the police. I thought the police were there to protect." "When I look, we're all on the ground and all you can see is blood. Everywhere. You can hear everybody hollering, moaning, everybody been shot and in pain." "My right arm was on the ground lying next to me. The only thing that was attached to it was a piece of skin. It had been shot off." The plea deal promises to end a contentious case that has lingered for a decade. In recent years, the U.S. Justice Department and a federal judge have traded accusations, with federal prosecutors seeking to force District Judge Kurt Engelhardt to recuse himself from the case after he tossed out the convictions. But it was Engelhardt who today accepted the former officers' pleas in the District Court for the Eastern District of Louisiana. He also ordered that several records in the case be unsealed. When he ordered a new trial in the case back in 2013, Engelhardt did so in a 129-page document that sharply criticized the government — especially because at least two prosecutors in the U.S. Attorney's office were found to have posted extensive and largely negative online comments about police in the Danziger Bridge case and other criminal cases, using anonymous accounts on the local news website NOLA.com. In response, federal prosecutors accused Engelhardt "of overstepping his bounds and exaggerating the impact" of the online comments, as local newspaper The Advocate reported. Nearly two years after Engelhardt ordered a new trial for the former police officers, a three-judge panel of the 5th U.S. Circuit Court of Appeals affirmed his decision, setting in motion the legal wrangling that resulted in today's plea deals. "While we disagreed with the legal reasoning that vacated the convictions and granted a new trial, we must undoubtedly accept the fact that the misconduct was unacceptable. I was not in the Office at the time, but I certainly deal with these consequences every day."